A decade of Interweave Knits magazine on one downloadable collection! Introducing the ultimate knitting lover's Interweave Knits 2000-2009 Decade Collection! Enjoy forty issues of Interweave Knits exactly as they were originally printed in 2000 through 2009, now available on the brand-new Interweave Knits 2000-2009 Decade Collection. 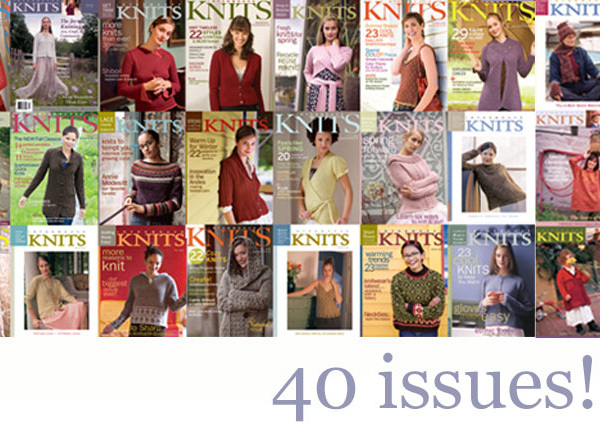 The full-color electronic versions of these forty magazines include easy-to-navigate tables of contents, easy-to-print patterns, informative articles, and all the tips and techniques that Interweave Knits is known for. Plus, this decade collection includes hundreds and hundreds of timeless, classic patterns for all skill levels. 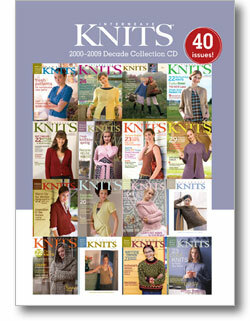 Purchase all 40 issues of Interweave Knits magazine on one Collection and SAVE BIG!!! If you purchased all these magazines outright, you'd spend $399.60! Now you can own them all and the convenience of having them on one Collection for only $99. That's a savings of OVER $300!